Advancing a continuous Chicago River Trail that improves the quality of life for all city residents is not an easy task. The river spans nine aldermanic districts; usage varies from recreational to heavily industrial in stretches; and the quality of access points varies greatly. As trail segments begin to emerge, there’s an urgency to develop goals for important related issues like affordable housing, water quality, trail design, and the environment. To jumpstart this process, we recently convened the Chicago River Trail Coalition. The coalition is a diverse group of public and private sector organizations, including elected officials from city and state governments. Active Trans will convene the coalition several times a year to keep the momentum going towards a continuous trail and develop policy positions. 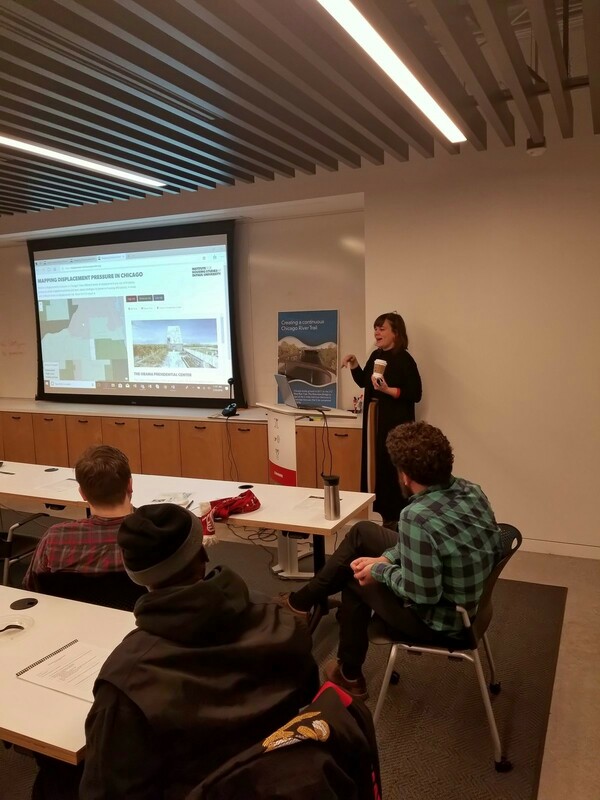 The first coalition meeting featured a presentation on affordable housing and lessons learned from the 606 trail project by Sarah Duda (pictured), Associate Director, of the Institute for Housing Studies at DePaul University. The Institute recently studied the development of the 606 trail; one of the report’s key findings is the lack of timely policies to strengthen affordable housing around the project before it started contributing to the displacement of long-term residents. Other factors to consider when trying to prevent displacement include examining a neighborhood’s characteristics – especially the vulnerability of a population to displacement – targeting interventions to the same geogrpahic area of a project, and ensuring responses are timely. Sarah also demonstrated the Institute’s new mapping displacement tool, which visualizes neighborhood-level displacement risk, which you can view here. Following the presentation, coalition members expressed support for the campaign’s 2018 goals. These goals include developing a trail vision for a three mile stretch of the South Branch, improving the connection on Logan Boulevard to the river at Lathrop Homes, and pushing for the development of the Weber Spur Trail on the northwest side. So what are the next steps and how can you get involved? Sign up to help with any of these projects: South Branch Framework, Logan Boulevard, and Weber Spur Trail. Click here to sign up for Chicago River Trail campaign updates.